Cobb County is still losing money on the new Atlanta Braves stadium, but it was at least down to $5.8 million last year from $8 million the year before. That’s mostly thanks to increased property tax payments from the development around the stadium, though, and as I’ve covered before, property taxes aren’t free money, they’re revenues that are supposed to pay for all the social costs of new development, so please everybody stop pretending that’s how fiscal math works. David Beckham’s Inter Miami (do I have to keep identifying them that way? you bet I do!) now wants to play its first two MLS seasons, 2020 and 2021, at a new stadium in Fort Lauderdale while waiting for its Miami stadium to be ready. I admit to being somewhat confused as to how an 18,000-seat stadium can be built in Fort Lauderdale in less than a year (even if it’s just a temporary facility that will eventually be converted to host the franchise’s youth team) when it’ll take two years at least to build one in Miami, but mostly I’m just excited for Beckham to have two different stadium ideas that can run into inevitable obstacles because he’s Beckham. The Oakland A’s dropped another new rendering of their proposed Howard Terminal stadium as part of their latest site plan, and mostly it’s notable for apparently being the only building left with its own electrical power after the apocalypse wipes out the rest of humanity, which should help ticket sales. Vaportecture fans will also be pleased to see that the gratuitous shipping cranes for unloading containers to nowhere have been moved to a different corner of the site, possibly for logistical reasons but more likely because the renderers thought they framed the image better there. Tottenham Hotspur stadium update: Finally looks on target to open in early April, except for the small problem that players trying to take corner kicks will tumble backwards down a slope if they stand more than one foot from the ball. Milwaukee-area residents will finally get to stop paying a sales-tax surcharge to pay off the Brewers‘ Miller Park next year, after 24 years of the 0.1% tax being in place. (The public will keep on paying for repairs to the stadium, but it’s already built up a reserve fund from sales tax payments for that purpose.) That’s certainly good news for Wisconsin residents who want to see their spending dollars go 0.1% farther, though even more so it will make it harder for anyone to try to use that tax stream to fund a replacement stadium for Miller Park, which the Brewers haven’t talked about but you know it’s just a matter of time. The Oakland-Alameda Coliseum Authority is set to vote today on a new short-term lease for the Raiders, who would pay $7.4 million in rent for 2019 and $10.4 millon in rent for 2020 if necessary, plus $525,000 a year in rent for the team’s practice facility for up to three years after moving to Las Vegas. Plus, Oakland still gets to continue with its antitrust suit against the Raiders for leaving in the first place. I love happy endings! Calgary city councillor Evan Woolly says instead of giving tax kickbacks to a new Flames arena, he wants to give tax breaks to all businesses across the city in an attempt to keep more of them in town. I’d definitely want to see his projected economic impact numbers before deciding if that would be worth it, but it certainly makes as much economic sense as giving money solely to a pro hockey team on the same logic. “Planning experts” told the city of Saskatoon that it should kick off downtown revitalization efforts by building a new arena, because that’s the “biggest piece,” and, and, sorry, I’m looking for any actual reasons these experts gave, but not finding any. Though given that one is described as a “real estate sales specialist,” maybe their reasoning is not so mysterious after all. The New York Islanders management emailed season ticket holders to ask them to sign a change.org “Support New York Islanders New Home at Belmont” petition, which leads me to think that maybe they’re taking this whole local elected official opposition thing more seriously than they’re pretending when they keep saying don’t worry, they’re totally going to have the place open by 2021. The Carolina Panthers are talking about moving to South Carolina, but only their offices and practice field, not their actual home stadium. Not that that’s stopping them from trying to get out of paying their stadium property tax bill. The government is Sydney is rushing to demolish a 31-year-old Australian football rugby (sorry, read too quickly and can’t tell all the Australian ball sports apart really anyway) stadium nine days before a new government might come in that would have preserved the building, and while I don’t fully understand the whole history here, you can read about it here while we wait for FoS’s Aussie sports correspondent David Dyte to chime in. Three of seven Hillsborough County commissioners have promised that a new sales tax for transportation projects won’t mean diverting money from the existing transportation project to, say, a Tampa Bay Rays stadium, which the mathematically inclined will notice isn’t actually a majority of the county board. It’s still not super likely that the county will try to raid transportation funds to pay for a stadium, unless maybe it’s for transportation costs related to one, and there’s still several hundred million dollars in construction costs unaccounted for, but anyway it’s worth keeping at least half an eye on as we head toward the team’s December 31 lease opt-out deadline. A paid consultant working on a new downtown arena for Saskatoon says it could have a “catalytic effect,” because of course he does, really, Global News, you ran an entire article that’s just interviewing one guy employed on the project? For this you want me to disable my ad blocker? Forbes’ Mike Ozanian reports that “a person with knowledge of the deal to keep Major League Soccer’s Columbus Crew in that city” says the new owners will pay $150 million for the franchise and spend $150 million toward a new downtown stadium, while “the public would foot the other $100 million.” Nobody else seems to be reporting on this, so maybe we should wait to be sure that Ozanian didn’t get his plus and minus signs mixed up again. The Atlantic’s Rick Paulas suggests that we end stadium extortion by forcing pro sports leagues to massively expand and then institute promotion and relegation, which would sort of work, if there were an easy way to accomplish this through antitrust legislation, which you’d think if Congress could manage that they could manage the much more straightforward measure of taxing sports subsidies out of existence, but who knows, maybe a “market-based” solution would go over better in these times, sure, what the hell. “Of course, cities could also elect leadership that will defend them against bad deals,” notes Paulas, which isn’t a bad idea either. Anaheim has signed a lease extension to keep the Ducks in town through 2048, involving the city selling the team 16 acres of land for $10 million — which if the stymied Angels deal is any guide would probably be a small discount, though Anaheim officials claim it’s market value — but the city will get a cut of arena profits after the first $6 million a year instead of the first $12 million, a threshold that’s never been hit. There are a lot of (small) moving pieces here, but I’m willing to say this is probably not too bad a deal, especially compared to some of the much, much worse lease extensions that cities have agreed to. Next is to to see about getting Angels owner Arte Moreno to accept the same logic, now that newly elected mayor Harry Sidhu is vowing to change “the hostile political environment in Anaheim” and “keep the Angels in Anaheim where they belong,” okay, Anaheim residents are probably going to have to settle for just a good Ducks deal. Atlanta Falcons COO Greg Beadles tells NPR it’s not team owner greed that causes stadium food prices to be so high, it’s just that after teams force concessions companies to bid as high as possible for stadium contracts, the only way they can make money is to charge through the nose for food! Anyway, NPR gets busy talking to fans at a Falcons game about whether they’re happy the team lowered its food prices, and they’re happy about it, so no time to fact-check whether team execs’ statements make any damn sense. Free refills on soda, woohoo! This was feeling like a long week even before Americans with guns decided to make a late rush to break last year’s record for most people killed in major mass shootings. Fortunately, we have news in the field of whether to devote scarce public resources to boosting the profits of professional sports team owners to amuse us! Ha ha! Are we amused yet? Los Angeles has been selected as the host of next year’s inaugural World Urban Games, a thing that is like the Olympics only it involves sports no one cares about, like three-on-three basketball. (Though admittedly, the Olympics also involves plenty of sports no one cares about.) L.A. had to offer no actual money to be the host, just use of its sports venues, so if anyone actually travels to L.A. to see these things, there’s an actual chance this might work out to the city’s economic benefit! Crazy talk! The group that wants to bring an MLB team to Portland has pulled its offer to buy the city’s school headquarters to build a stadium on the site, saying it would be better used for affordable housing. (Read: The community hated the stadium idea, and they didn’t want to fight about it.) The group will reportedly announce a new site by the end of the month, but it’s not worth holding your breath over because MLB isn’t giving Portland a team in the immediate future, if ever. There’s a new pro-ticket tax group in Columbus calling itself Protect Art 4 Columbus that describes itself as “a group of art enthusiasts, sports fans and other community members,” and if this isn’t an Astroturf group, they really needed to come up with a name that made themselves sound less like one. I do not have the energy to explain the beef between the wannabe Austin MLS team owner and the wannabe Austin USL team owner and how they’re both building stadiums and supporters of one stadium are accusing supporters of another stadium of lying about their ballot petitions by saying “we’re trying to build a soccer stadium” when it’s really to stop the other guys from building a soccer stadium, so just watch the video, it’s blurry and confusing and shot in portrait mode, just like the kids today all like! The Minnesota Vikings‘ $1 billion stadium still sounds like crap for concerts, reports the Minneapolis Star Tribune in its review of an Ed Sheeran show last Saturday: “Anytime Sheeran slapped out a beatnik-funky drum beat on his guitar and put it on repeat, such as ‘New Man’ or the pre-encore finale ‘Sing,’ it sounded hopelessly mucky and un-funky, sort of like a kitchen-sink garbage disposal trying to clear out gallons of half-dried concrete.” Time for Zygi Wilf to demand a new one yet? Only 28 years to go on their lease! The Miami Dolphins stadium’s revenues were up 39.7% last year, and expenses were only up 31%, so guess owner Stephen Ross’s $350 million renovation is paying off (though a large chunk of that was actually paid for by Miami-Dade County and by the NFL). It makes it all the more puzzling why the county handed over additional subsidies last summer that could be worth as much as $57.5 million, but actually, since the stadium renovations were already done and paid for by then, it would be puzzling even if Ross were losing money on the thing. Florida, man. Here’s a fun Guardian article on what makes a good soccer stadium. Not sure there’s one takeaway other than “Design them to be good places to watch the match with seats close to the action, and try to make them fit into their immediate surroundings,” but that’s more than most U.S. stadium designers do, anyway. Cleveland Cavaliers owner Dan Gilbert and Detroit Pistons owner Tom Gores still want an MLS expansion team in Detroit, and while they’ve determined that removing the Lions stadium’s fixed roof and building a retractable one like MLS asked would be prohibitively expensive, they have offered to spend $95 million on a training field and other soccer fields throughout the city, though Crain’s Detroit notes that it’s “unclear” if that spending “would use any public funding.” If it would, this will be an interesting test in how badly MLS wants its teams to play in soccer-friendly outdoor stadiums, and how much it just wants new owners who’ve shown they can extract cash from their local municipalities. Hey, check it out, it’s an NPR report on how Worcester, Massachusetts has been undergoing a boom in development and influx of new residents thanks to its cheap rents compared to nearby Boston, to the point where some locals are worried that they’ll be priced out. Is it too late for Worcester to take back that $100 million it’s spending on a Red Sox Triple-A stadium that was supposed to be needed to put the city on the map? Who says that new stadiums don’t transform the areas around them? Why, the SkinnyFats restaurant near the new Las Vegas Raiders stadium just added a new craft beer tap room! That’s gotta be worth $750 million. The deal for the new New York Yankees stadium included new parking lots that were mostly to be paid for by a nonprofit shell corporation that was to own them and collect parking revenues, but now that it turns out nobody wants to pay $45 to park for Yankees games when there are plenty of cheaper parking options plus multiple subway and commuter rail lines nearby, the company is $100 million in default on rent and taxes to the city, with no real hopes of ever paying it back. I should probably add this to the “city costs” section of my Yankee Stadium subsidy spreadsheet, but I don’t have time this morning, so just mentally note that city taxpayers have now put up almost $800 million toward a stadium that was sold as involving “no public subsidies,” with state and federal subsidies putting the total taxpayer bill at nearly $1.3 billion. Former Phoenix mayor Skip Rimsza says one of his proudest accomplishments is not building a downtown stadium for the Arizona Cardinals, since instead the city got to use the land to build a biomedical campus that provides way more jobs and economic activity than a football stadium. Opportunity cost in action! I’d love to write an article on all the things that cities didn’t get to build because they focused on erecting new sports facilities, but sadly my Einstein-Rosen Bridge portal is on the fritz. “There is no city where we have not been able to literally put something together something where the public sector gains and the private sector gains,” he told CBC Radio’s Saskatoon Morning. Setting aside Rosentraub’s odd syntax — it’s a transcribed radio interview, I’ll cut him some slack — you may be forgiven for wondering, What, what the hell is he on about? Isn’t this entire website a 20-year record of cities that have not been able to put together something where the public and private sectors both gain? Rosentraub has long been an odd duck in the sports stadium world. 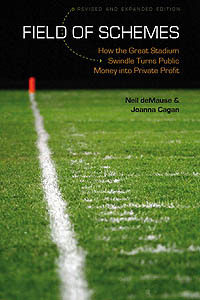 Way back in 1997, he wrote a book called Major League Losers, which, as you can probably guess from the title, talked about private sports stadiums as bad deals for cities. Since then, though, he’s been more sunny on the prospect, noting that building venues downtown can move economic activity to the city center — true, if your only concern is where people spend their money and not how much they spend in your metro area overall. It will be left as an exercise for readers to determine whether this change of message is related to Rosentraub’s side business of working as a consultant for cities and teams that want to build downtown stadiums and arenas. Anyway, building a new arena isn’t an inherently terrible idea, if the city will own it and get any increased revenues from it, and — crucially — if those new revenues will be enough to make it worth the $400 million-ish price tag. The only sports tenants are the minor-league junior hockey Saskatoon Blades and the National Lacrosse League team the Saskatchewan Rush, so this deal would have to pencil out based on being able to draw more concerts to town. Could Saskatoon make an extra $25-30 million a year just by offering more concession stands and restrooms? That’s the interesting and important question that needs to be asked, rather than nattering about how an arena can “anchor” an “entertainment district.” I can recommend several sports economists, or even arena managers, who could begin to address that question, if anyone in Saskatoon is interested.